Hi my name is Ray Austin, I am owner and operator of Austin Air Companie. I have been servicing the Katy Texas and surrounding areas since 1999. I became a Texas licensed HVAC contractor nearly a decade ago and 2018 will mark my 10th year anniversary of being in HVAC business on my own. I have been involved in the HVAC field since 1994, and in 1996 I graduated trade school with AOS degree as HVAC / R Mechanic. This accronym stands for Heating, Ventilation, Air Conditioning / Refrigeration. My total HVAC experience spans nearly a quarter of a century at 23 years as of 2018. I hold a Texas HVAC contractors license to work on HVAC equipment up to 25 Tons in capacity. My company specializes in Residential based HVAC systems and methodologies of repair and in some cases system redesign for energy efficiency. While I can and do occasionally work on larger equipment in light commercial and light industrial these parts of the HVAC market are not my primary focus. AC Service and AC Repair with you in mind. I understand fully what it’s like to have your air conditioner act up in the middle of summer. I come prepared to your home to get your HVAC system back on line and cooling again as efficiently as possible. In most situations this occurs in under 3 hours or less from the time you place your AC service request. Call Ray directly at 832–475–6895. I am EPA Universally Certified to handle ANY refrigerant. (often called Freon). an aerosol propellant, refrigerant, or organic solvent consisting of one or more of a group of chlorofluorocarbons and related compounds. There are many kinds of refrigerants. I am licensed to safely and responsibly handle them. For the sake of keeping this short, Freon means refrigerant. Your HVAC system needs the proper refrigerant and the proper amount needed for your system to operate properly and efficiently and the kind and amount of freon your AC system requires can vary due to a host of factors. I NEVER mix refrigerant types, nor do I reuse old refrigerant for very important reasons (cleanliness of refrigerant system). This is not nor has it ever been proper practice. If you don’t use the proper virgin refrigerant to make repairs (no matter what you call it–– freon or whatever) your system will likely not perform well and your AC system could be damaged beyond repair. If you are confused please realize I am not. I am well versed in freon (refrigerant) repairs of this nature. Further information and understanding: HVAC equipment does not use up Freon (refrigerant). Your HVAC system only needs refrigerant (freon) in the event your system has started to leak refrigerant. 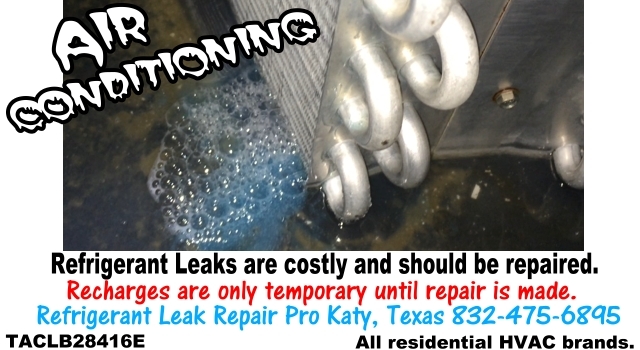 If I do not find and fix the leak, the freon will leak back out over time depending on severity of the leak. Due to increased cost of Freon (nearly all refrigerants have gone up in cost.) It is recommended you repair the leaks. This is a constant challenge mostly due to ever rising costs. There are really only 3 refrigerants currently designed to work ’properly’ with the HIGH TEMP air conditioning application, with a few more that are being considered. Katy, Texas area is a hot humid tropical climate. If you don’t use the proper refrigerant for your system it is my experience you will regret this decision in short order due to the heat of this climate we live in. For those reasons, be careful who you listen to. If you have the money for a new AC system, go ahead and do whatever you want. Don’t say I didn’t warn you. As of 2018 there is no such thing as a perfect refrigerant. They all have flaws to one degree or another. Different applications call for different designs as well as different kinds of refrigerants (freon). Common applications are: High Temp air conditioning, Medium Temp refrigeration, Low Temp Freezers. Realize what I talk about in regards to refrigerants (freon) on my website and Katy Texas Air Conditioning Blog are only in how they pertain to the High Temp Air Conditioning Application. 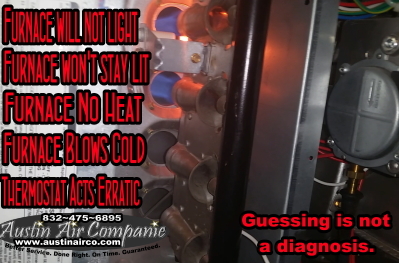 It is very common for people to try to self diagnose their HVAC system I can’t tell you how many times someone calls me and tells me: "Hey, my AC stopped working and I think I need some freon." Certainly, your AC system may need freon and those refrigerant leaks repaired. This does happen, but you may be surprised to hear that nearly 90% or more problems are due to electrical problems with your air conditioning system. Things like AC keeps tripping breaker, AC will not run or turn on, AC fan motor won’t spin up, AC condenser is hot to touch or AC condenser is burning up, AC condenser turns on then shuts off. Air Conditioning Electrical Problems not corrected properly can lead to more problems. 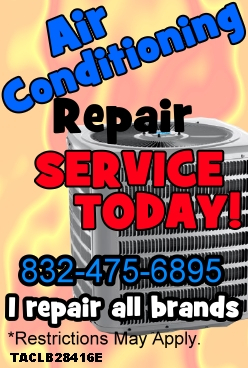 Austin Air Companie provides air conditioning repairs and HVAC maintenance services in Katy, TX | Cypress, Tx | Richmond, Tx and the surrounding areas. The Air Conditioning Installation animation above is an elaborate example of my work. My HVAC company primary focus is AC repair for Katy, Texas | Cypress, Texas | Richmond, Texas and in some cases a repair may not be the best approach to solving your air conditioning problems for your home. In those instances I will work with you on options to replace your HVAC system or if possible parts of it (Retrofit Repair – Skills Required!). Obviously the more pieces of your HVAC system that you replace the less likely another break down will occur. However, I am not in the business of forcing you to make a decision you are not ready to make. I will give you options and the choice is yours how you wish to proceed. Realize that in order for your AC system to be the most efficient it can be requires replacing of the entire AC system in most cases. This varies due to what the original equipment consists of. I work on and repair all brands. My ultimate goal is to give you options that will work. To set your in home appointment call me directly at (832) 475–6895. You don’t only have one light switch in your home, do you? Of course not; you want to be able to illuminate different areas of your house at different times, and in different manners. I believe that you should be able to do the same when heating and cooling your home. That is why I am happy to offer HVAC zoning services in Katy, TX. With the use of HVAC zone controls, you can heat or cool only those areas you want to, and to the temperature you desire. Call Austin Air Companie today to learn more about how I can improve your comfort and improve your home efficiency. My name is Ray Austin (832) 475–6895.